C.J. Knoblauch served as foreman of the Portage Lake National Industrial Recovery Act camp in Cass County. 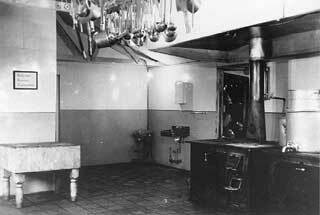 In the following excerpt from his memoir he recalls the importance of the camp cook – and the importance of observing dining room rules. The cook, Frank Ratican from Grand Rapids, was the highest paid man in camp. He had operated a restaurant in the Rapids, but was also a lumber camp cook and meals were along his line. A new man coming into camp would eat ravenously for 2 or 3 days, then get filled up and eat normal meals the rest of the time. One young fellow ate half a pie every noon for the first 3 days he was there. There was no limit, serving dishes were always kept full by the cookee cruising between tables and the cook stood behind the serving counter to fill them as brought up. A typical breakfast would consist of bacon or ham with eggs, cooked cereal, fried potatoes, pancakes, dark and light cookies, dark and light cake, doughnuts and coffee. At noon and evening, in addition to the above pastries, there was pie, and always two kinds of cake. There was also lunch at 9 PM. As in lumber camps, the silence rule applied in the cookshack, and the cook ruled there. All the men were aware of this, as most were familiar with the camps. One noon a husky ex-sailor broke the rule, complaining to the cookee about the canned milk. A day or so later he did this again. The cook came from behind the serving counter, strode down to the offender and bawled him out. Then he took off his apron, threw it on the floor, said "If you're half a man you'll come outside with me," and went out the door. The sailor got up and followed him. I thought we would have to find a new cook as Frank had a big paunch, was older, and looked no match for the sailor. Everyone jammed in the doorway, so Charley and I ran through the meathouse, out the back door, and around to the front. The strawboss, an ex-pug, was just pulling Frank off the sailor. Frank had put him down in the snow and pounded his face black and blue and split his lips. Frank followed us to the office and asked for his time. We told him to forget it and go back to the kitchen. Times were hard, so the sailor stayed in camp, but it took a long time for his face to heal. It was very quiet at meals after this. 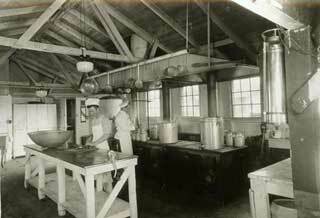 Cooks at Civilian Conservation Corps camp near Tofte, 1934. 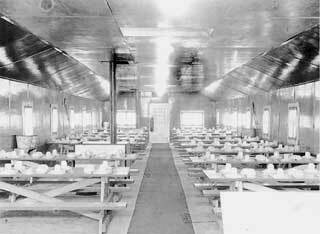 Civilian Conservation Corps camp mess hall, probably Company 707, Deer River, 1936. 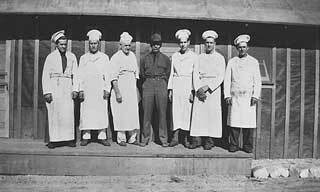 Cooks, CCC Camp 4727, Rice Street and County Road G, Vadnais Heights(? ), 1937. Knoblauch, C.J., author; Stanley Johnson, Collector, Papers Regarding CCC camps in the Chippewa National Forest, 1933-1937. MHS Manuscripts Collection.